Monday through Thursday, August 17-20, nearly 200 parents, friends, educators, and students spent “60 Minutes” praying for high school students at high school campuses all across Clark County. When a man walked up to one group as they were debriefing their time, he inquired what they were up to. When they said they were praying for the students, he said, “That is wonderful! I am the principle here, we need more of this!” They had a go od time of prayer for him! This year there were 20 people who prayed at a high school where last year there was no one praying there. Some schools had just one person praying. Others had 30 or more on site. There were prayers for physical safety. For believers to know and love one another. For teachers to have wisdom and creativity. For spiritual, emotional, and physical blessings. Here are three of my personal stories from those days. 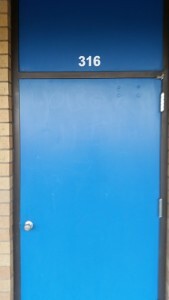 Union Hig h School has large signs above the doors of various classes. 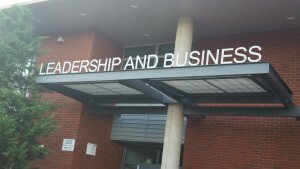 It wasn’t hard to pray re: leadership and business standing in front of these large letters. As I rounded the corner of another school, I sensed I was to pray that the gospel would impact this area of the school. I prayed it would be clearly communicated and received. As I was praying, I looked up to see the room number was 316. Hummm – reminded me of John 3:16. This enhanced my prayers. As I approached one large high school, I sensed the Lord had special prayers He wanted prayed there that night. I waited and no one else showed up. Hum, I was expecting at least a few others. So, I proceeded, anticipating God would give me some good prayers. I began walking and praying and… and… my… prayers… were… very… dry… and… stil…ted… and…even… life…less! It wasn’t pretty! I didn’t know what was going on! I continued on for the next 15-20 minutes slowly walking the perimeter and praying as best I could. But nothing stirred me. By the time I reached about the ¾ point around the school, I said, “God, I am frustrated. This isn’t working the way I anticipated. I am lonely here, and even a bit depressed!” As clear a as bell, the Lord spoke to my heart and said, “Now you know how to pray for these students!” It stopped me in my tracks. Literally. I stood there for a minute and realized that God had not answered me the way I expected Him to. He answered me by letting me experience what scores of students there and at other school experience every day. That is when my prayers became effective. Because the Lord had answered me in a far better way than I ever expected, I prayed well at that school and for the last several days! Overall, we believe God hears and answers prayer. We believe He deeply cares about kids. We believe that because we have prayed, things will be different for these kids and campuses. Thanks to all who took part. Palm Sunday is a reminder of some wonderful events in Jesus’ life. It was a “pre-enactment” of His second coming. He was received as King, the whole city was talking about Him, and He received a portion of the praise He will one day receive. It is wonderful that many in the Church today recognize this day. But not much is mentioned about what happens next. Mark 11 tell us that on Monday, Jesus reenters the city, this time without fanfare. Making His way to the temple, He causes quite a stir by over-throwing the tables and driving out the money-changers. Jesus leaves not doubt about why He did these things. He ties two prophetic scriptures together – Is 56:7 and Jer 7:11. It is very good that we remember Palm Sunday. And it is equally good that we remember what could be called Prayer Monday. Jesus’ simple statement has much meaning. The desire of the Father is that His house would be known as a house of prayer. That is, He wants the place where He dwells to be a place where there is lots of good, healthy communication taking place between Him and the others who live there. New Testament Scriptures are clear that His Temple refers to both individual followers (1 Cor 6:19) and the gathering of His followers (1 Cor 3:16). Are our lives and are our congregations marked by lots of good, healthy communication with God? There should be equal access for everyone to this place of prayer. The phrase “for all nations” is not a call for God’s people to pray for all the different nations (though that is an excellent thing to do) so much as it is a warning that all people – people in all ages and stages of life – should be not only invited but encouraged to enter this place of prayer. Everyone should be included. No one should be excluded. We, as people, have the capacity to thwart God’s desires. The words “but… you” should cause us to pause. “But” is a contrast. God has a clear desire… but. His desires are not always fulfilled. With the next word – “you” – Jesus places the responsibility for God’s unfulfilled desires squarely on the shoulders of the people in front of Him. They are the ones who redesigned God’s house. God wanted it to be one thing. They made it something else. The result of this remake of God’s house is that everyone was robbed. God was robbed of good fellowship with His people. Some people lost physical and spiritual opportunity. And others lost the opportunity to lead people into a better relationship with God. It is so right that we remember and rejoice in Palm Sunday. It is right that we let the truth of that day live on. And it is right that we remember “Prayer Monday.” May we, our lives personally and our lives together, be a clear demonstration that we are in good, healthy, frequent communication with the Father. 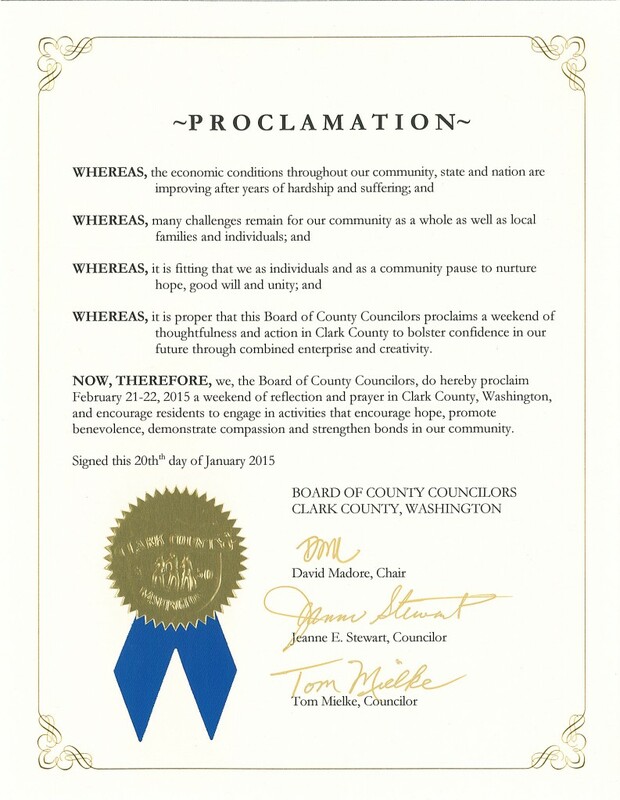 For the fifth consecutive year, the Clark County Councilors (formerly known as the “Commissioners”) have proclaimed a weekend of Reflection and Prayer for Clark County. This year it will be February 21-22. We encourage you to do four things because of this. Rejoice! Not many political leaders specifically ask those who believe in prayer to have a time of prayer for their community. Consider how you will honor this proclamation, personally and in your congregation. We encourage you to at least read it and pray based upon it with your friends, in your home group, and/or weekend service(s). Join with others from different spheres of influence and need in our county on the evening of February 20th for a time of prayer for God’s work to be advanced in our county. 7:00 -9:00pm, at Lighthouse Church, 7808 NE 94th Ave, Vancouver. Here are some specific suggestions for prayer. That God would raise up godly public servants who will faithfully represent His priorities. See 1 Timothy 2:1-4. That God would give these leaders a spirit of good will, unity, healthy relationships, good judgment, understanding, humility, wisdom, and practical problem-solving skills. That we would all respond in thankfulness and appreciation to God when He answer these prayers. What a good day of prayer! My understanding is that there were about 43,000 prayer events that took place across the USA yesterday. Very cool. Here are glimpses of my day. Breakfast with a great group of pastors at City Harvest Church. Good fellowship and prayer led and directed by five great pastors in Clark County. We prayed for each other, we prayed for our county, we prayed for our leaders. A Clark County Commissioner, David Madore, met with us. We prayed for him, he prayed with us. After a meeting with the Clark County Prayer Connect team, we drove downtown to participate in the noon-time rally at City Hall. 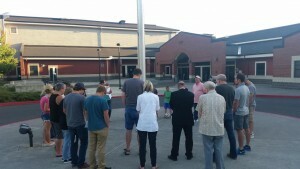 Not a large group – about 50 – but some great prayer. We prayed through the prayer which Anne Graham Lotz wrote specifically for that day. We prayed for our elected officials, including Mayor Leavitt, who was there for the entire time praying with and for us. We prayed in small groups, responsively, individually, and even some “one-word” prayers. From there about a dozen of us did a walking prayer tour of downtown Vancouver. Mark Pellitier – who has actually written the book on Clark Counties spiritual history – told us some great stories which pointed us to prayer. We prayed at Esther Short park, 10th (Evergreen) and Franklin – the sight of the largest evangelistic effort in Clark County history! – at the soon-to-be-opened Boomerang – where “Generosity Returns” – and also at the amphitheater near the Quay. Beautiful weather – almost too hot – and some prayers that will make a difference. There were three evening gatherings in Clark County for the NDOP. Marilyn and I were part of the Camas event at Calvary Community Church. With the help of some local pastors and a local council-women, we prayer some great prayer for businesses, schools, first responders, the Church, and the government. A bit tired this morning, but pleased! We gathered. We prayed. It mattered. 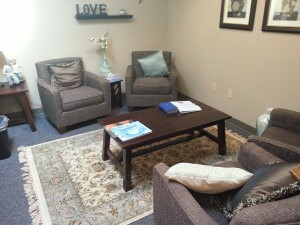 Much of what International Renewal Ministries and Clark County Prayer Connect is involved with and known for relates to prayer. Prayer Summits, Living Prayer Seminars, “encountering God” through prayer. Teaching on prayer, preaching on prayer. Facilitating prayer retreats, weekends of prayer, and days of prayer. Corporate prayer and individual prayer. Listening prayer, Scriptural prayer, Encouraging more and better prayer by and for people. This is all good and we are delighted to respond to this calling. But what is not always mentioned is that we do not see prayer as the ultimate desired destination. Rather, it is the vehicle to the destination. The destination is not simply trying to get more people to be engaged in more prayer. The desired destination must be more of His presence and power released in and through individuals, congregations, and communities. There can be no better destination. The lack of His presence in and through His people is disastrous! The manifest presence of God in and through His people is what distinguishes us from others. The destination we long for is more of Him. The vehicle that can get us to that destination is prayer. My Summer schedule is typically more flexible than the rest of my year. So, I get to ask God if He has any specific Summer assignments for me. This year He gave me a couple. One is to “give myself to prayer.” Now you may not think that is unusual, given my ministry responsibilities. But, the specific sense I got from this assignment was to mark out significant time during my work day for prayer. To see prayer as part of my daily job description. I pray regularly in the morning – both individually and with Marilyn. I pray several times a week with others. And I pray several times throughout the day for various reasons. But, until recently, I did not have specific time marked out in my work day for prayer. So, this Summer, I get to “give myself to prayer” in a fresh way. As part of this call, I have encouraged others at US Digital Outreach Center (where my office is located) to join me. There are about 35 ministries and 75 people who office in this place. (It’s a great story! If you don’t know about it, check it out here – though this video is a bit dated.) While I was praying in the Skylight Conference Room here at the Center (pictured below), I remembered Exodus 30:7-8, which I recently read. There Aaron was commanded to burn incense each morning and evening. Of course, from Rev 5:8, incense represents the prayers of the saints. The idea came to me that, together, we could do the same in the Skylight Conference Room. So, we are working on having at least one person in the room praying each workday morning from 8:00-8:30am and each workday evening from 4:30-5:00pm. We are over half way there already! During these times we will worship Jesus, pray for ministries we care about, pray for US Digital, and for God’s work in Clark County. Might the Lord be calling you to “give yourself to prayer” more intentionally? If so, what would that look like in your life? What could it look like where you minister or work? Since the Fall of 2007, I have had the privilege of representing the Luis Palau Association in Clark County. This partnership developed because of the common vision between LPA and IRM. One of the aspects of this relationship has been to assist the Church to serve Clark County in meaningful ways. Rallying people to united prayer is a foundation for effective service. So, since the Spring of 2010 I have met with a few other Prayer Pastors in Clark County, WA. As we met, we developed a greater burden to see more and better, united take place by and for the people of Clark County. In the Summer of 2013 Clark County Prayer Connect became and official “DBA” of International Renewal Ministries. Posts here will be related to how God is stirring more service and prayer in the congregations, cities, and various spheres in Clark County. Copyright © 2019 by "Tychicus will tell you everything." Ephesians 6:21. All Rights Reserved. Subscribe to "Tychicus will tell you everything." Ephesians 6:21's RSS feed. Made by ThemeSweet. Proudly powered by WordPress.